My first major task, in setting the tone and vision for our event's marketing campaign, involved designing and developing the logo. The design process was extremely iterative -- I was constantly checking in with the management team and sharing new design sketches and mock-ups both online and on paper, based on the detailed feedback I had received on my work. My ideation began on paper, with very basic, low-fi sketches of what the logo design might look like. All of the design guidelines are indicated on orange sticky notes. Sticky-note brainstorming session on the logo design. The thick, sans-serif, semi-bubbly font ("American Purpose") used for the main title of the event, "Theta Breakers," draws the right amount of emphasis to the title without dominating the entire logo. The silver-teal color scheme was chosen for its gender-neutrality and its flexibility in being appropriately applied to a diverse range of contexts and types of marketing materials (i.e. flyers posted in stores and around campus, merchandise sold at the event to a wide age range, etc.). Having a figure stand on-top of the letter T in the title makes the logo a little more playful, but also powerful - the figure feels like a leader. The curl of the kite tail around the letter H and into a small spiral at the end further adds to the playful touch of the logo and makes the THETABREAKERS title feel more 3-dimensional. 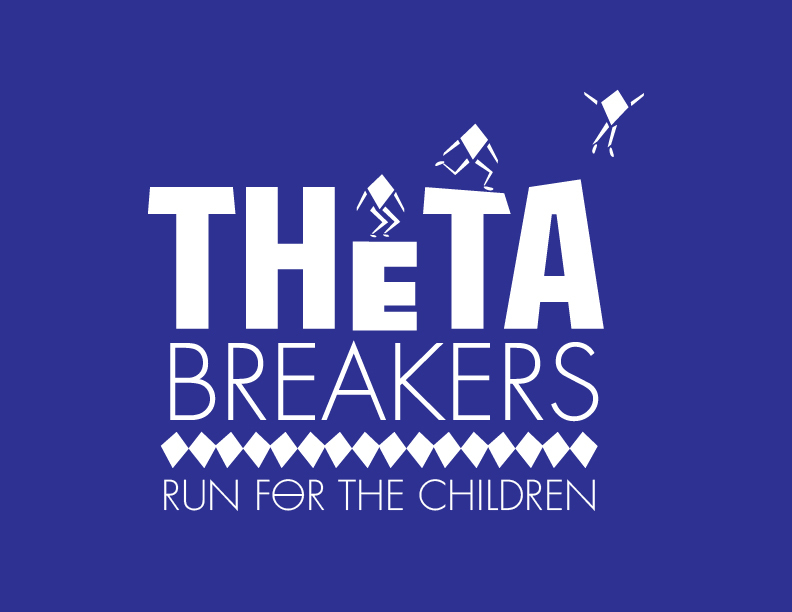 Finally, the stripes on either side of the slogan, "Run for the Children," vary in thickness in a way reminiscent of a racing stripe, intended to give the subtle allusion to the fact that the event is based on activity and speed. From there, I moved forward into the design of our primary flyer, which would be used to recruit runners and participants from the Bay Area for our event, online and offline. This flyer was printed and posted around Stanford Campus and beyond, such as in local active-wear stores, as well as emailed around widely to several different lists and organizations. The soft hills are meant to signify the fun, hilly terrain of the course for the event. The two signs held by figures on the terrain are also symbolic, since students actually do hold signs and banners on the course for the race event in real life. These graphics also break up the flow of the flyer in a way that makes it feel more personal, fun, and interactive, than text-heavy and data-driven. To introduce the event's affiliation with the "Child Advocates of Silicon Valley," I opted to share a succinct, poignant sentence about the mission of the organization and drop the link of the site subtly below. Similarly, the simple, casual tone used at the top of the flyer, in describing the event, deliberately makes the event seem more approachable and easier to connect and identify with, even upon a quick glance over email or while passing a billboard. Finally, the outlined four steps for participating in the event, put in simple terms and each marked with a checkbox, further encourage participation in a friendly way. Flyer used for attracting company sponsors for the event. Though text-heavy, the flyer design breaks down the important information into three simple, readable categories: a) Who we are, b) What we do, and c) How to get Involved. The next major step involved designing the shirt that participants would receive at the event and wear during their 5k/10k event. One of the first executive decisions we made was to run with a darker, navy color to make the design more gender-neutral than the teal used before. Then, I started sketching ideas in my notebook and eventually fell in love with the idea of kite-shaped figures (in honor of Kappa Alpha Theta's kite symbol) playfully jumping along the letters of THETA.